Literature Online has a new look! So what better time to feature it as Resource of the Week. If you’ve never used Literature Online, it’s got some really useful features and a huge collection of over 330,000 works of English and American literature covering poetry, drama, and prose from the 8th to the 21st centuries. LION also includes thousands of critical articles, essays, biographies and encyclopedia entries. 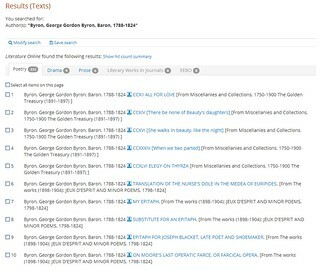 Quick Search: searches all content, including texts (poetry, prose, drama), literary works, criticism and reference. Text Search: find full texts of poetry, prose and drama, but author or literary movement. Use the ‘Look up’ function to get more reliable results. View texts by this author to read full texts of their works. You can also search for works in a particular genre, or by an author in a certain time period, or of a particular nationality. Criticism search: find full texts of articles on a topic of your choice. Reference search: find biographies of authors, bibliographies on certain topics, and more. Use the ‘look up’ function to be more specific. Tick ‘biographies’ to search for biographical information on authors. For more hints and tips, go to the Literature Online guide.